Namely, when you have just started to use a fresh pick (of the same variety, but unused, as opposed to a new "style" of pick). It always seems to me that the "compensating" from the last one being worn, to the new one being perfect causes initial minor Fuxation for a short while till it's "broken in". It makes playing just slightly harder work for a while. The ones I chuck away are worn but I'd bet some other players wear them out more than I do. Some use them till they break I think. I tend to go to 3 or 4 "Carpet Sharpens" and then lob them or the change will be too drastic when I stat with a new 'un. It's usually around every 4 months I change em. Anyone else get this "Compensation Fuxation" or tell us what "Pick Habits" have you got? I use Timber Tones picks - with the band I'm in at the moment, there's an awful lot of aggressive picking. That means that I can get from "new" to "chuck it away" in a single rehearsal with the wooden ones. Being a little strapped for cash, that means I tend to only use them for recording at the mo (they do sound better for my purposes). I do also use their aluminium ones, which last longer; they stay pretty much in the zone for a few weeks, which allows a lot more time for getting used to it. I tend to find that the best way to adapt is to have a couple of days of using something really sharp and pointy as a kind of "reset" - my picking technique is quite sloppy at the best of times, so pointy picks really do help improve accuracy and then the transition to more gig-friendly picks is easier. Normally a pick'll last a while until I lose it, or it's fooked. I have a three year old. The chances of a pick still being around to wear out is slim. Rarely use them, but when I do any old thing will do, thick, thin, old, new. I've started using Jazz iii Ultex ones, and they're really nice. I prefer the tone of the red nylon ones, but the ultex ones do seem to last better. i hate new picks...i find that when i wear down a pick it feels nicer and actually sounds darker and thicker. I dont know if thats technically possible, or if i am imagining it, but a new picks produces more highs than a worn one. Orange Dunlop Tortex (0.60?) every time for me. I go through them surprisingly quick. My pick habbits are super dull. All of the picks I use for general playing are Dunlop Max Grip Nylons. I use a range from .60 to 1mm, depending if I'm playing acoustic or electric and what I'm playing. I find changing pick size really throws my playing, and these days I don't get to practice as much as I'd like to so the less things I change the better. I will sometimes use a different pick for recording but for general playing I never change from the Max Grips these days. Picks are a replaceable wear and tear item to me, just like strings. When they're worn out it is time to get some more. It is pretty easy to find Dunlop Nylons in most shops and they're cheap in bulk online. Soon as I don't like the feel of the tip I switch to a fresh one. I tend to lose loads of picks anyway, I can't remember actually throwing a worn out one away! Where the fek do the disappear to though? Is the 'land of the one sock' ? Pick Grumbles would make a great stage name. I bought a 3mm stubby from a local guitar shop a couple of months ago. The very nice shop owner who plesantly served me asked if I'd like a receipt. I told her no, it's fine and thought to myself, like I could break one of these. After purchasing my pick, I trotted off to try a couple of guitars. After I'd finished, I aimed to leave the shop but struggled with the urge not to go over to the owner and say, "I should've taken the receipt, I've broken my pick while playing." It was a harmless joke and I didn't expect her to take me literally. All smiles, she opened the plectrum box up, you know the type, and said "Oh, take another." "It's fine, I'm just joking." "No, go on, it's ok, take another." She wasn't getting it so I had to explain explicitly what I meant. I felt stupid, I'd made her look like a fool, and ever since I've been back she looks at me like I'm a p[r]ick. I've got a bag with about 100 of them I lose them way before I wear them out. I've just started using thumb picks. Since I had an accident years ago and severed several tendons and nerves in my right hand ... and lost some feeling ... I've had a problem with pick dropping. I have compensated with an iron grip ... and spare picks in the mike stand and stuck in scratch plates etc. Never been able to get the hang of hybrid picking before ... but this seems to be getting the job done for me now. Have to customise em a bit ... and I still dig in to much sometimes and get strings caught ... but it seems worth persevering for the Travis picking etc. The only things I can't do are picked harmonics ... but I may yet find a way round that. 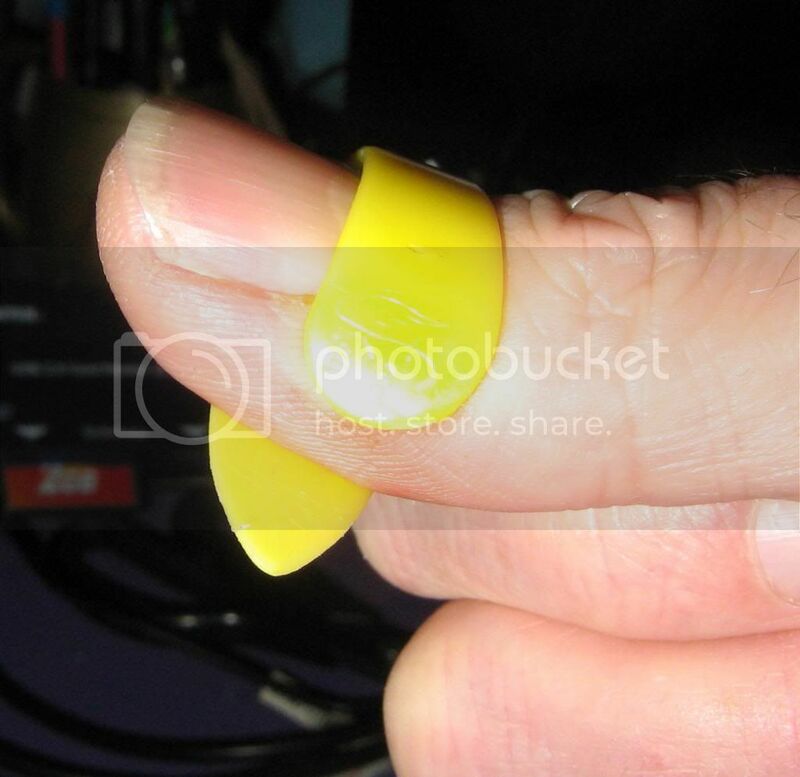 Is that one of them speed pick thumb picks?